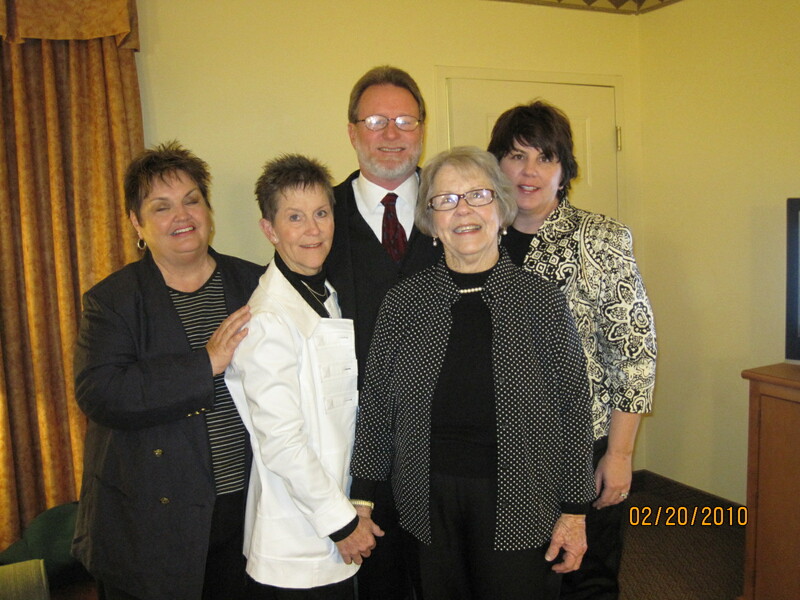 with a simple ‘Amen,’ folks lingered; some took pictures; others mumbled a few polite words, and they left…..
when its family, you’re there till the end (Janis)…. 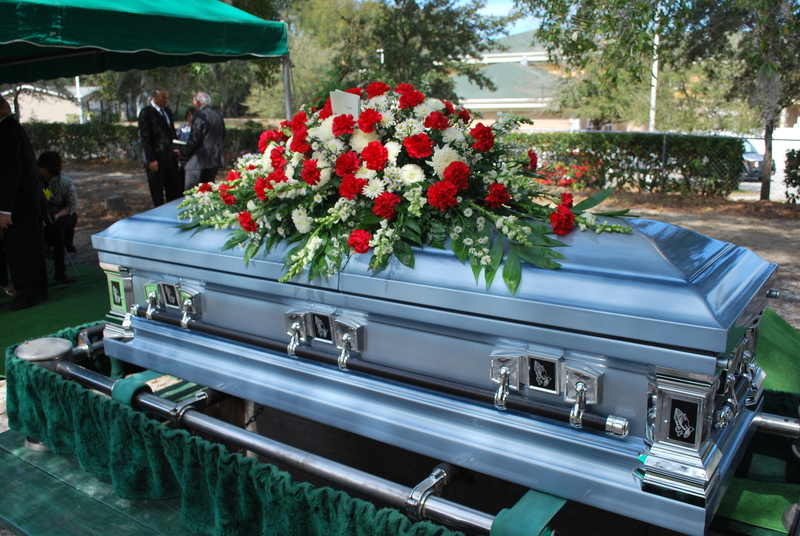 Losing a father is never on the top of anyone’s list – in my own way I find comfort in one of the few places that he and I shared and spent extended time together – riding old highways as he ’ciphered-out’ our surroundings – Dad was real good at ‘figurin’ things out. I guess life is like a highway, another place with a good seat to appreciate whats right there in front of us, an opportunity to acknowledge others as we pass, a place to remember – and a time to move on. 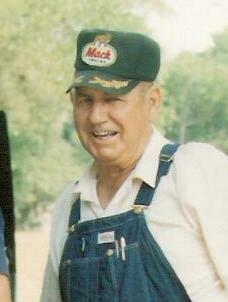 The last day of my surprise visit to Dad’s was good with a couple rides in his truck of fifty-years past. Other than that it was a normal time just ‘hanging’ around his place listening to him recount past memories. W.T. 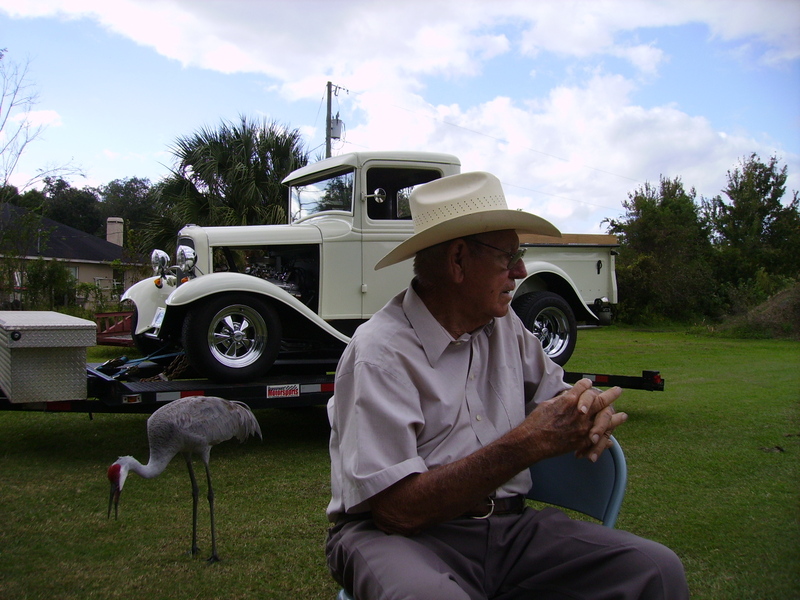 Haynie loves to talk, and he loves showing/pondering on and speculating about each piece of his “stuff” all mechanical in nature and hence the connection to this old truck. Later in the afternoon as while sitting on lawn chairs out near the truck, three very large birds flew over – Dad looked up, and then made some sort of ‘Tarzan’ bird call. To my surprise the birds circled, dropped, and walked right over to us – evidently he has been feeding them since they were chicks (Sand Hill Cranes) and they continue to come back for more. So that’s about it, a fine visit because after a vehicle accident of his own – and having to give up driving (major change for Dad) – the year has been tough. With it all he seems to be doing pretty doggone well – proud, and tough as a bulldog – he’s even got a growl like one, even though I didn’t hear it once on this particular trip to Florida……..
Ok, with the help of JP and Melissa (I used their truck/car trailer) I was able to take the old pickup that Dad once owned, the 800 miles to see my him (WT Haynie). He expected my visit, but not the surprise that sat on my trailer. 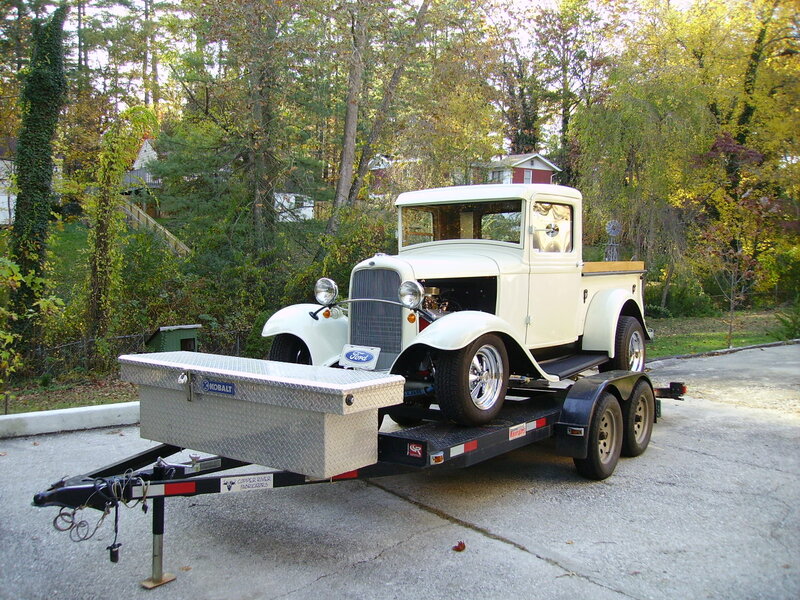 My first plan was to drive it up to his house, but as I neared figured that I would simply back the trailer with the truck just outside of his sliding glass door where he begins each day viewing the world and contemplating direction. This was the better plan. 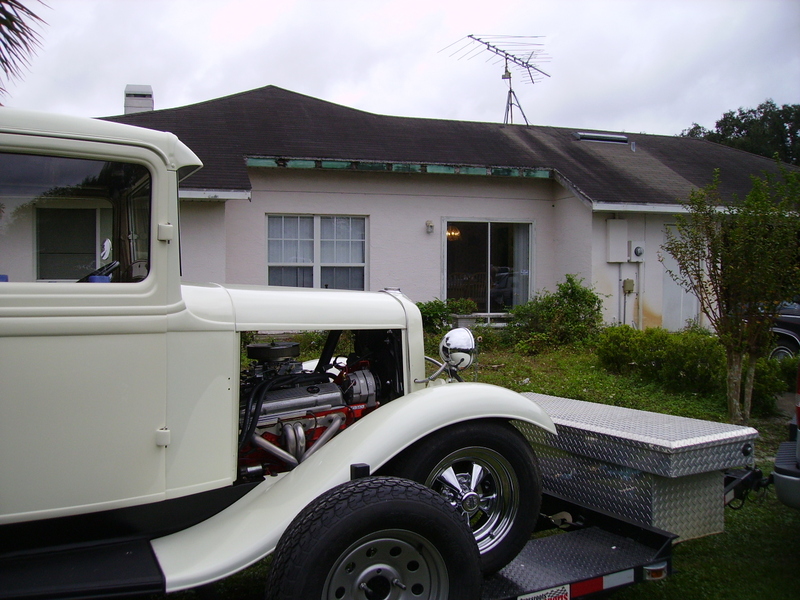 So at 7am (and hoping that he would soon be in his chair) I made it to the house and parked it quietly outside of his door – after 50 years, this truck had unexpectedly returned into his world. It was kinda neat because as I stepped out of the tow vehicle (he was at the table) I could heard him hollering to someone else in the house to “come-look!, come-look at this!! 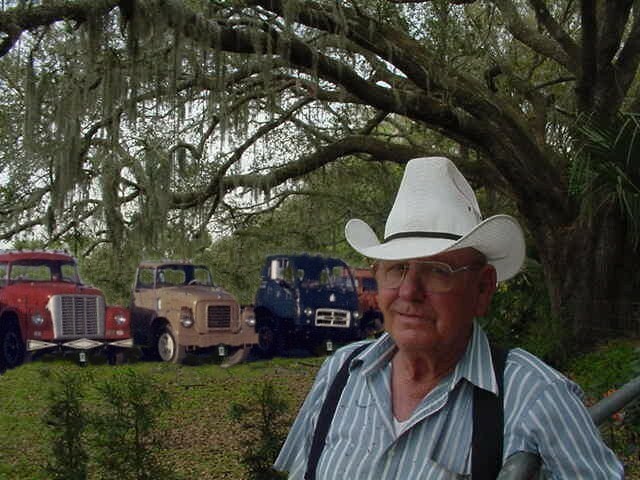 !” I figured he either had an eyebrow hair that needed pulled or had indeed noticed his old truck – it was a good sound; and one of surprise. As I looked in from outside I didn’t see a grumpy man of 82 taking his morning punch at the changing world outside, but I saw smiles and through out the day heard lots of seldom used chuckle’s – as a matter of fact it was that way the entire visit. 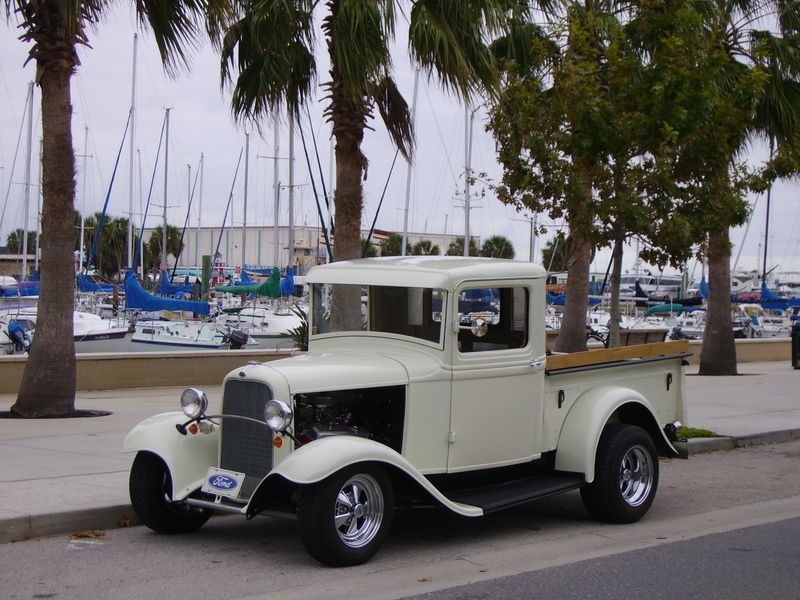 I’m not sure how it would be for any of us to see the same vehicle that we had owned and cared for FIFTY YEARS earlier, but I can tell you that as a mechanical-minded person; it meant alot to my father. 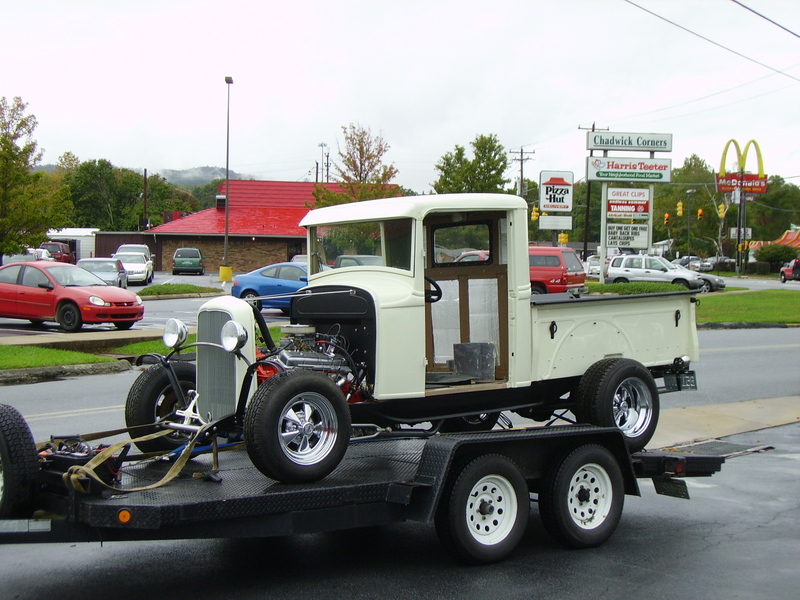 We took several rides that day, even drove it over to several of his local friends places of business (they had Hot-Rod projects too) and swapping stories of years and cars past. Dad would always begin by saying “I told you I had one,” and how he had traded that riding mower (which had thrown him off) for it in 1959. Dad had stories about it all day……. 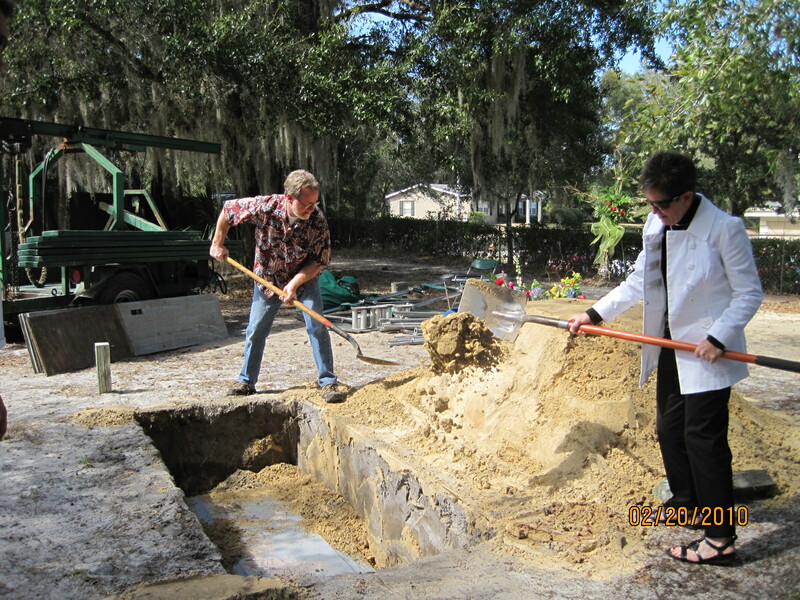 (how he once used it to buy/sell Cadillac engines, how he ran it for two weeks without water (he would just stop and visit with a friend as it cooled – then go on, returning the same way) how he mixed concrete in the back of it after Hurricane Donna) and so on ……. even made me go get the neighbor immediately next door (rebuilding a later model pickup) so that he could tell his stories once again. It was an active day for Dad right up until dark, at which time he was worn out (for good reason) and in bed by eight – all was very good. Wasn’t a bad day for me either – plus I even found time (during his noon siesta) to take a ride to the nearby marina and walk the docks. 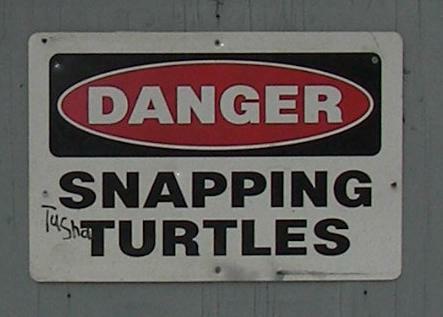 One more day in “Boca-Boca” (all the Seinfield facts are true) and I’ll head home…….. 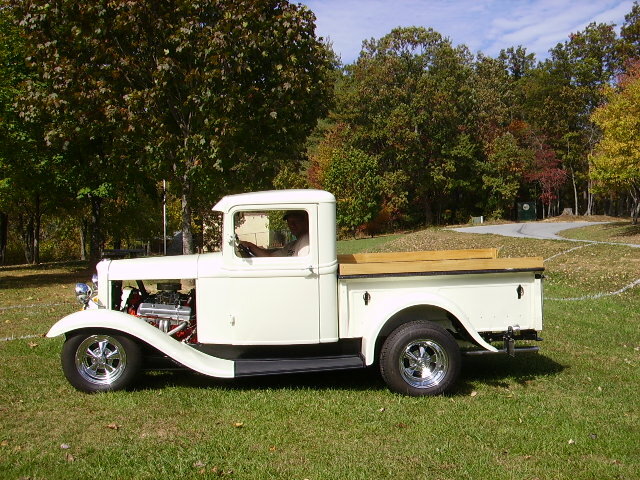 In 1960 my Dad traded a riding lawnmower for an old Ford truck; a 1932 rusted green pickup truck that Dad called (and it was); a ‘beater. 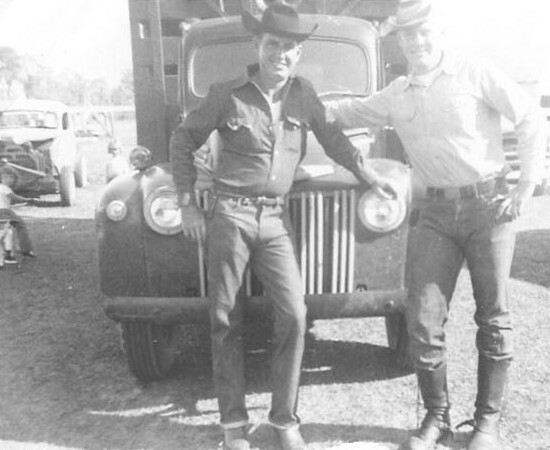 ’ That was his ‘work-truck’ and he drove that ‘beater’ to the far side of town and work – everyday for 4 years. First to third. 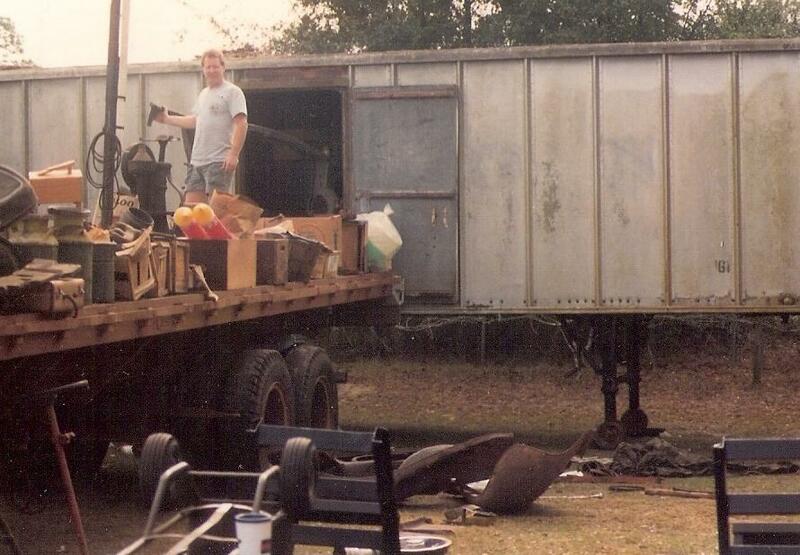 Doesn’t sound like much but I remember the truck well… As a kid on Saturday’s I went to work with him. 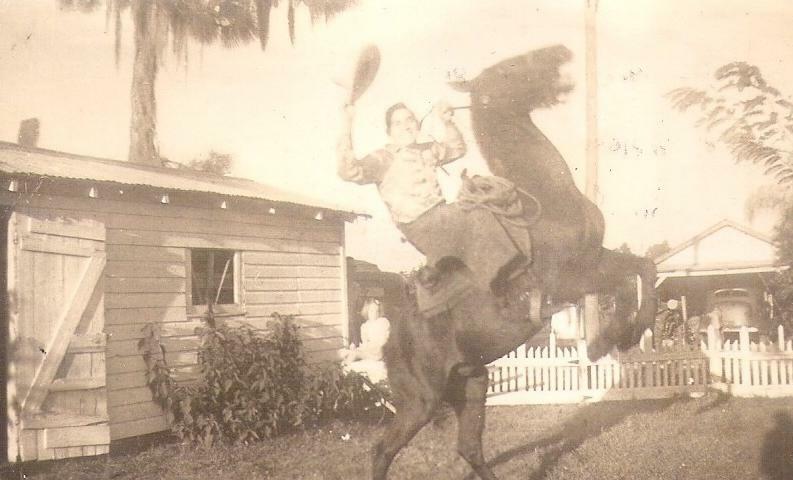 Dad was always up before the sun and gone soon after that… so for me the ride was early. 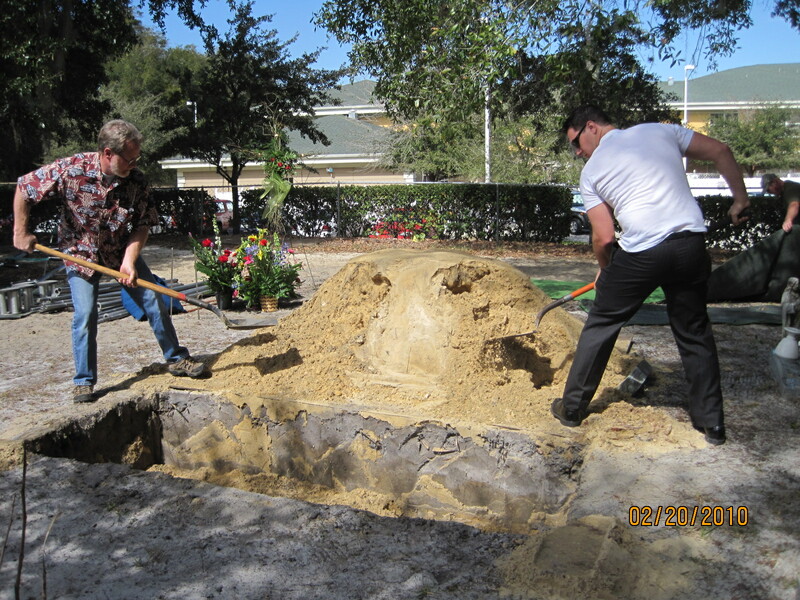 We traveled out Hanson across the hump at Fowler, felt the rugged RR tracks near the local radio station (WMYR) and on through the deserted neighborhood streets of old Ft Myers. Florida is pretty much flat terrain so it wasn’t uncommon for Dad to shift directly to third from first gear (drove me nuts, even as a kid). I remember peering over the ‘nose-like’ hood as we tunneled through that thick morning fog. 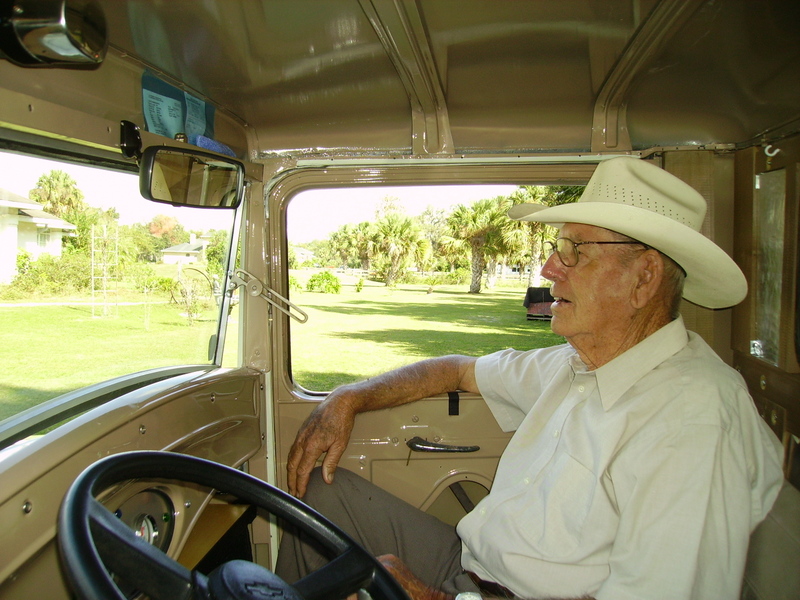 I recall the doors shaking, the cab rattling, and could feel the dampness seeping through the many cracks of the cab. For a boy of ten, the truck was a mechanical goldmine – in it’s own way it was like a carousel; possible to see and feel the parts that provided ‘life’ to this one little rusty machine. 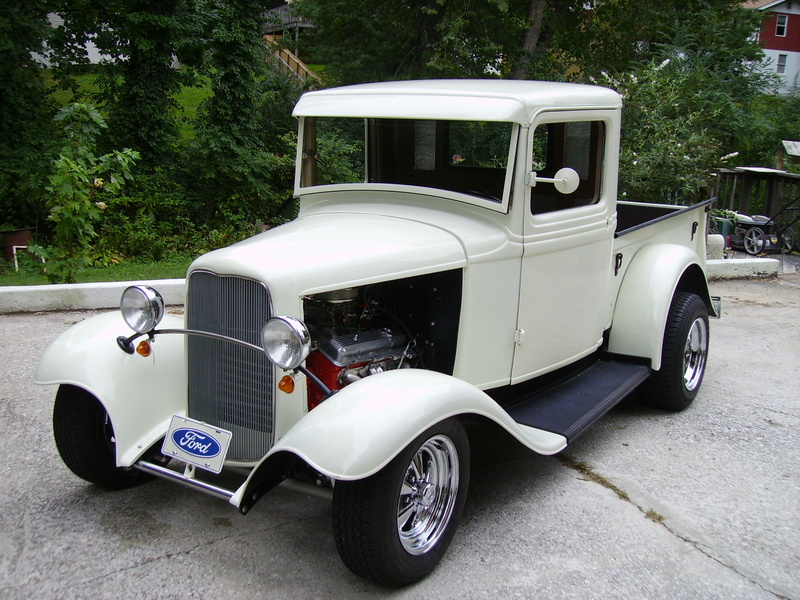 During those years a friend of his owned a race-car so Dad often carried a couple of gallons of ‘nitro (high powered fuel for race engines) in the back of the little pickup. One morning in 64 (I wasn’t with him) the little truck ran out of gas, so Dad resorted to using some of that ‘nitro to complete his drive to work. 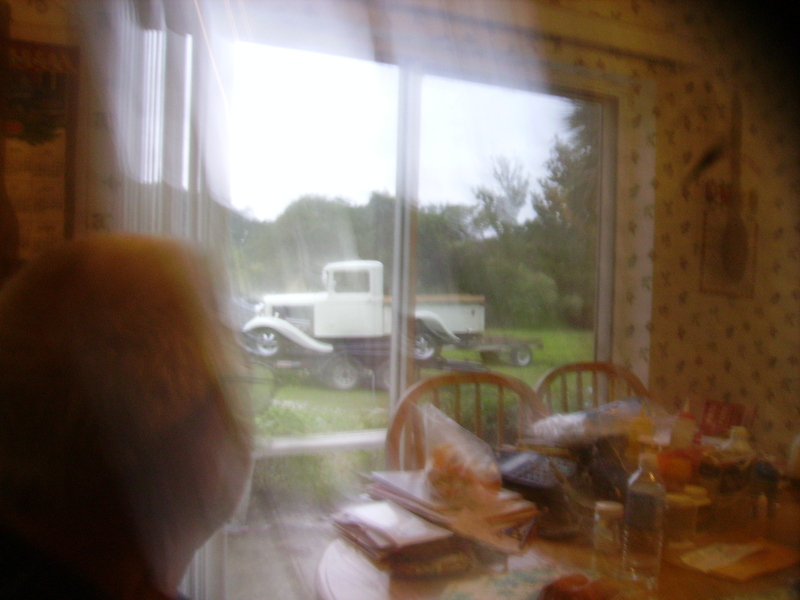 Being’s a kid at the time I remember the story went something like the truck “ran like someones scalded dog” (I think it was a boy dog because in the actual exclamation it was a “son of” something…. ); point being that the motor literally blew apart (cracked a cylinder wall) it ran so well. 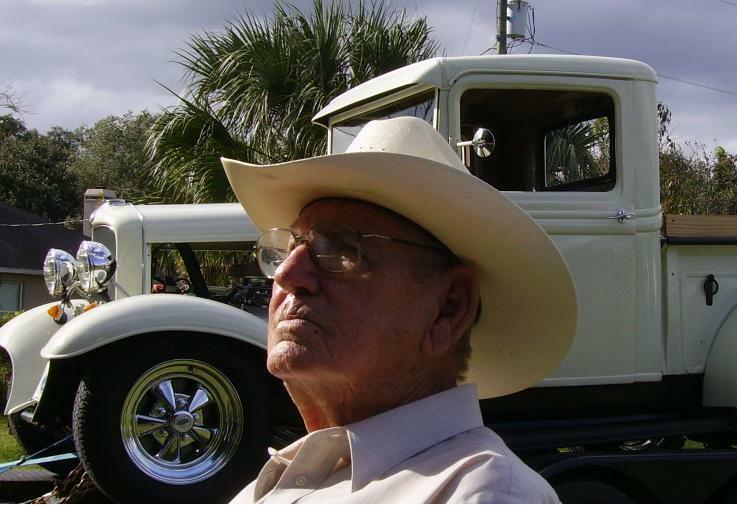 With the motor blown Dad’s ‘beater’ was towed to an open field near his shop off Palm Beach Blvd and covered with a canvas tarp – out to pasture. 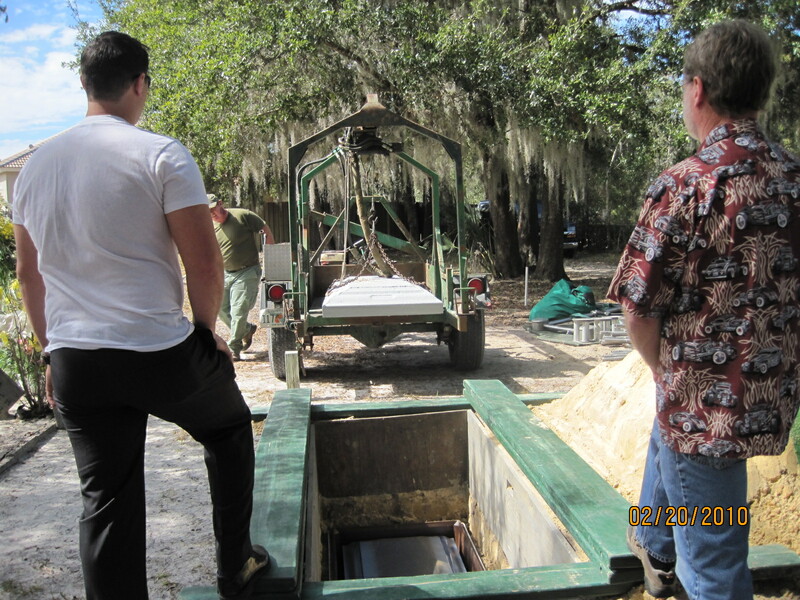 As a young teen I visited that field numerous times (like my grandsons above) not only to remove the standing water from the tarp but to slip under the cover and onto the driver’s seat – pretending to drive it as my father had. – this is where the little pickup remained dry but hidden for 24 years. In 1992 when I turned forty Dad turned the relic over to me. I borrowed a trailer, loaded the kids (and the p-bucket) into the van and drove to Florida for the truck. 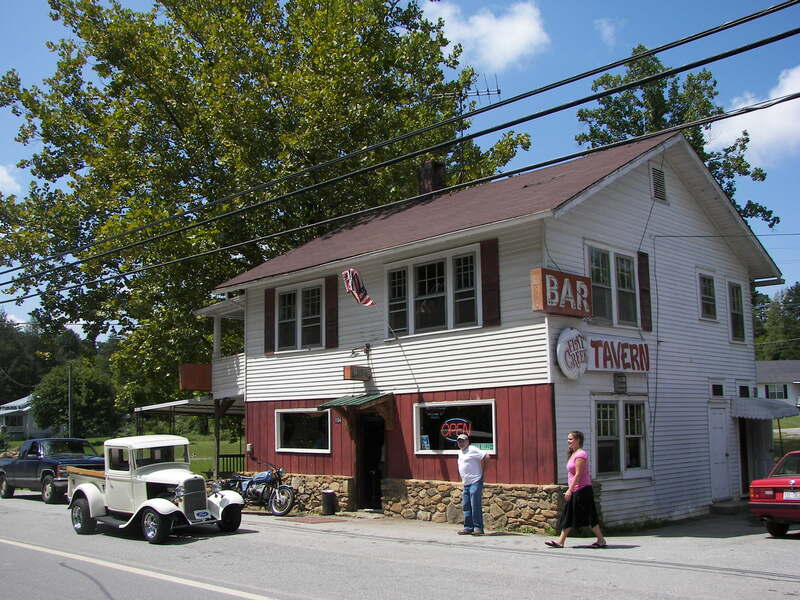 In the Carolina’s I had a barn with a dirt floor – but no garage. I still had a family to raise and those priorities remained. 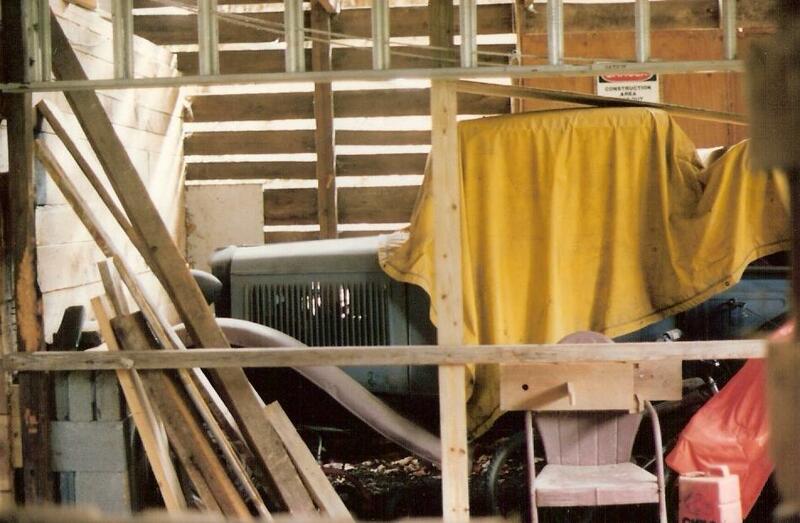 The little truck was stored in an empty stall within the barn – always my favorite corner of the building after a few beverages. 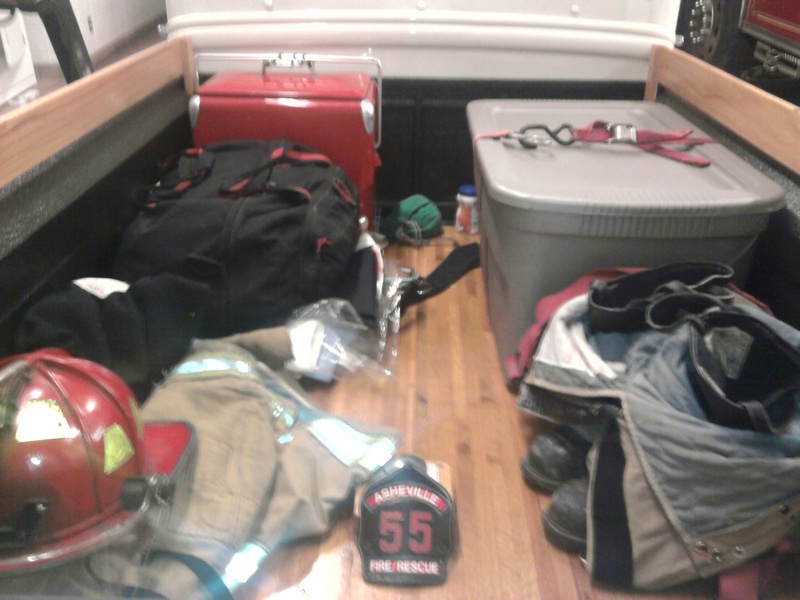 Ever riding in the truck again remained a remote possibility, a distant dream – for I had never owned a home with a garage or a cement floor to work on. This dream wasn’t going to happen in the dirt of the barn so the ‘bones’ simply remained dry while we raised a few cows alongside. 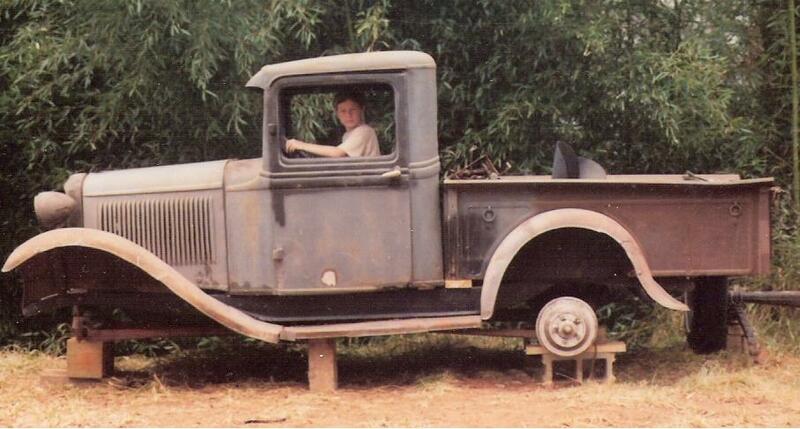 The kids grew, and the little pickup would have its day. 2005 – Thirteen years later we moved into a home with a real garage, a cement floor, internet, and ebay! Now with the kids mostly up and gone I felt a ‘byte’ of hope. 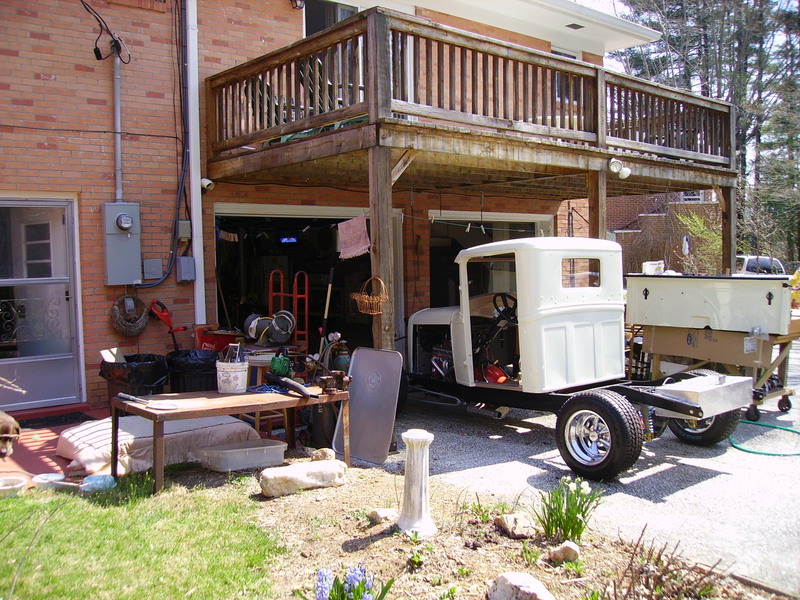 Along came a torch, a welder, a spare frame, a refrigerator (a shop necessity) and a television on the wall – my friend Bruce Dewey donated an engine, a real boost to the project. 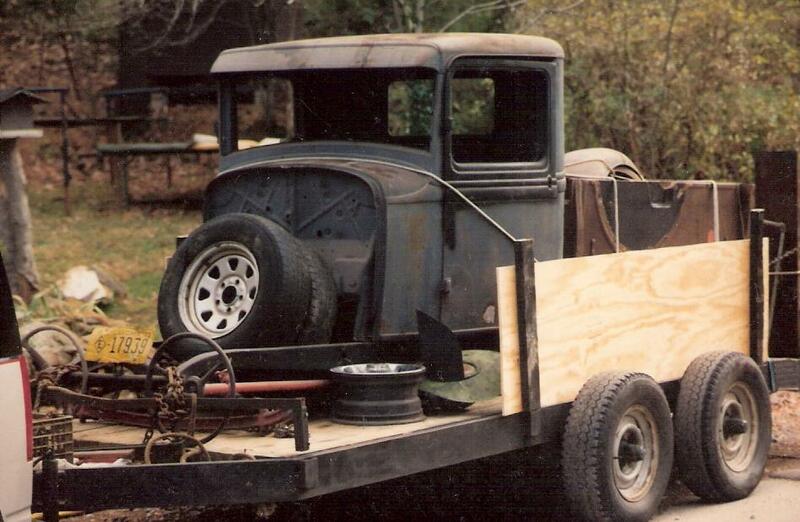 After 41 years, work resumed on the old rusty pickup truck. 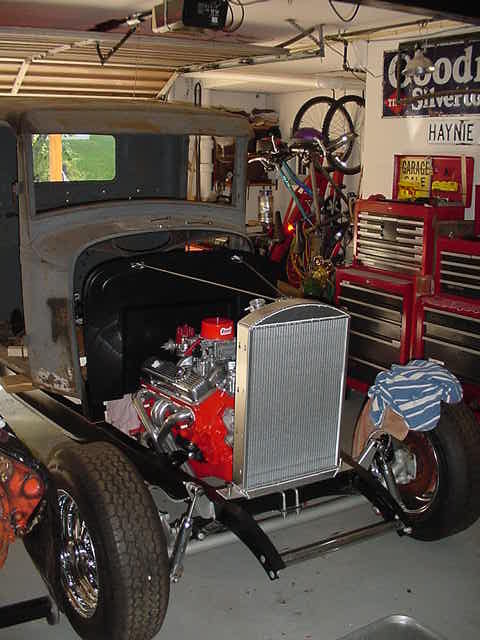 I contemplated direction the parts and ideas slowly came together – I watched as people on TV completely redid cars (Overhaulin) in a week! (I also saw folks on the same TV catch boat loads of fish in thirty minutes) I couldn’t do either so I’ve just set my own pace; sometimes working hard and long – and then sometimes just completely getting away from it. 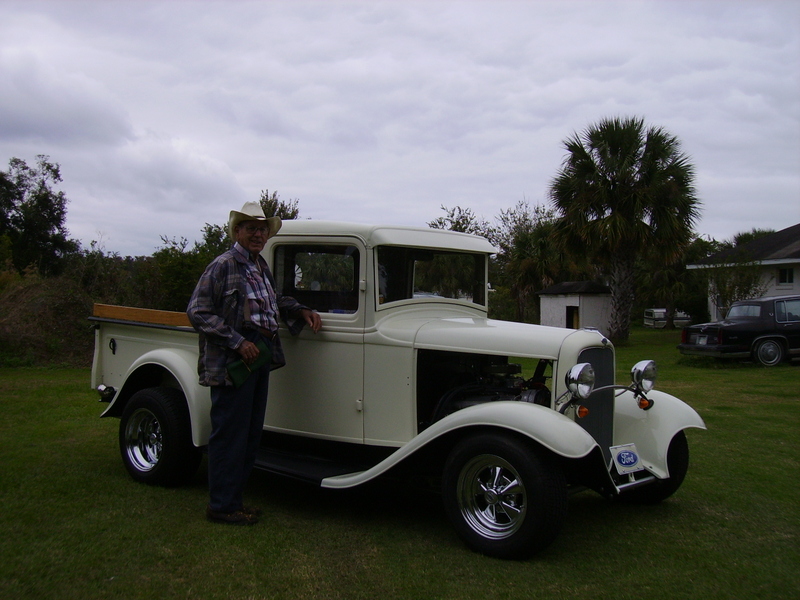 2008 -It took three years, but there came a day when the 12-year old boy that had once pretended to drive this old rusty pickup from under a tarp an a field – stepped back in as a 55-year old man. It was for more than to wiggle a lifeless shifter; it was time to actually drive it. I checked the brakes, then put it into gear and felt the ‘life’ from within. The first time in 44 years that the little truck had been on the highway under its own power, one of those really good moments; a ‘little circle‘ with the best of results. 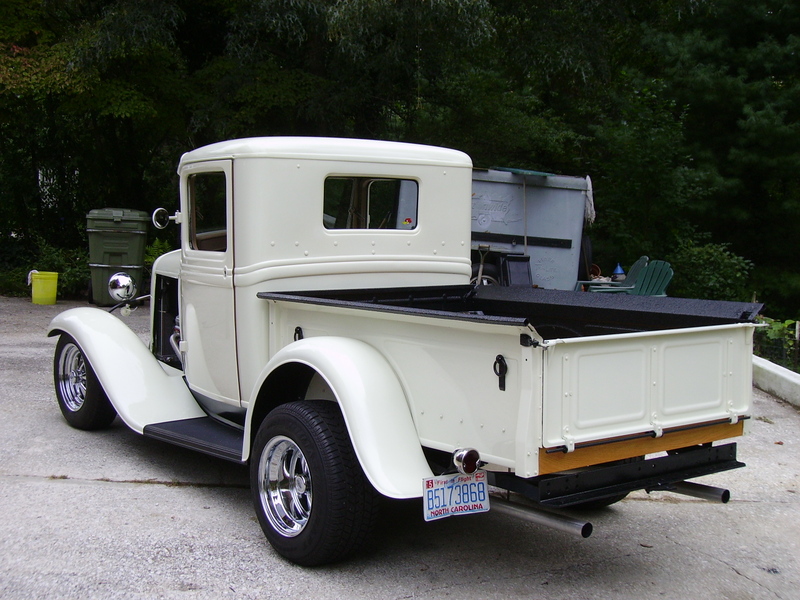 When I drive the ‘old pickup’ now the doors and cab still shake – but for a much different reason; the rusty and dented fenders have been replaced with modern fiberglass and the remaining steel of the cab and body shines with a ‘Cool Vanilla’ paint. The splintered wood of the old floor in the ‘bed’ is all new and unscathed, the glass is clear and without cracks. Somewhere in the heart of this machine is my Dad’s rusty old truck – the same old pickup where 45 years earlier a boy of nine once listened to his father’s conversations and dream that he too could drive this truck to work – just like his Dad. In its own way its all been a pretty special ride. 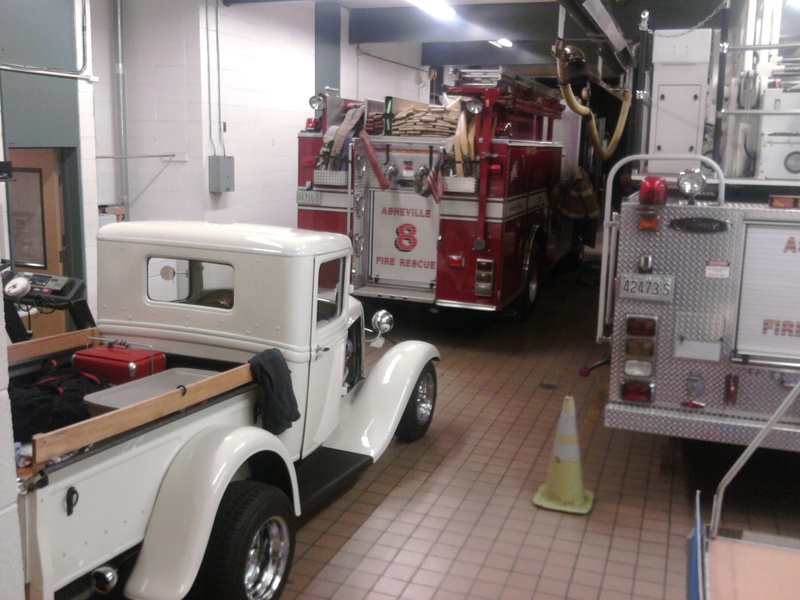 In fall 2009 on the last official day of my 31 year career at the Asheville Fire Department, and 50 years after my Dad first drove it to his workplace – I drove the old truck to work one last time. 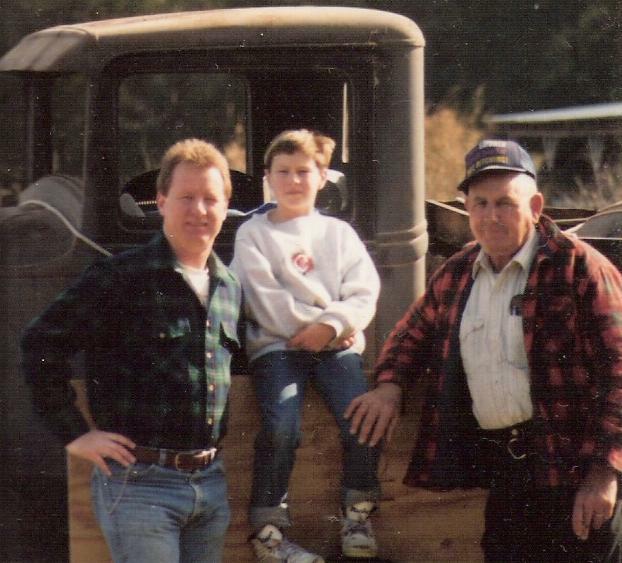 Losing a Dad is never on the top of anyone’s list – in my own way I find comfort in one of the few places that he and I shared and spent extended time together – riding old highways as he ’ciphered-out’ our surroundings – he was real good at ‘figurin’ things out.